On my secret project--It's become a priority now, as the deadline (February 7th) –like any deadline-- has a way of zooming up fast! My goal is to have the knitting finished by January 10, the finishing done by the 20th--there is a bit of finishing (beads, and closures, and trim) and all the other details taken care of by the 30th. There was some work done on it yesterday—at the full house yesterday—there were 15? 16? of us at Panera's—and a yarn sale! Betty—YOU need to uploaded the remnants of your stock on your Esty Store! But there was also a lot of sharing--I haven't been to Parera's in two weeks and there were so many of us there--and some beautiful FO to admire, too! Betty showed up with a big (soft sided) carrier box of yarn and fiber. Teabird went home with some, and so did Jennifer, and so did Liz, and so did I! Others, too-- For a while there it was a feeding frenzy. This is the skein that came home with me. It is doing to turn into a sweet briar.. something! And soon! 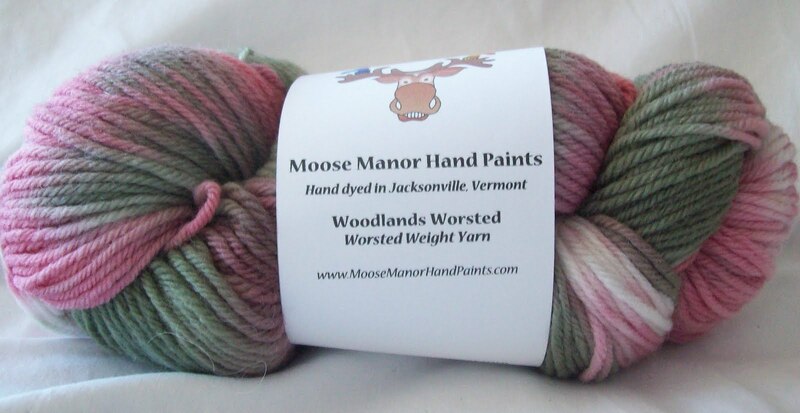 Betty called the colorway Woodland Rose--and it suits. Betty went home with an almost empty carrier. It's bad for her business—WE buy all her stock before the public gets to see it. We buy all her yarn before she gets to photograph it. If you smart, you'll haunt her etsy shop and snap up what's left! (There is nothing posted right now--Her REAL life job cuts into her personal business time-- but later today, tomorrow—watch out. The yarn and roving will come and go in a blink of an eye.) Her Mix Berries sock yarn cried and cried --but I just can't afford to by MORE sock yarn right now! But wouldn't it be fun to have a wardrobe of hats? Very warm ones for very cold day, (days when you just don't care about hat hair) and softer gentler hats--ones for milder days--and don't want hat hair. And what wardrobe would be complete with out a fancy milinary quality hat,ones for special occations? And some wild and crazy hats for wild and crazy days? My thistle down is perfect for Bobby Burn's birthday at the end of the month—but I think I need a special valentines day hat too, and emerald beauty for St Patrick's day. Maybe a great ski hat for the mid winter break, and ... definitely, a great collecion of warm stylish hats are needed! Also, really nice photos of the skein! Can't wait to see what you make with it! I'm soooo jealous! That yarn looks so ... so delicious!